Ten partners from port and waterways administrations, universities and environmental agencies around the Elbe, Humber, Scheldt and Weser estuaries founded the EU INTERREG IV B project TIDE to propose the integrated management of estuaries leading to benefits for ecology, economy and society. The TIDE (Tidal River Development, www.tide-project.eu) project was launched in early 2010 and focuses on the four northern European estuaries Elbe (D), Weser (D), Scheldt (B, NL) and Humber (UK). The estuaries are characterised by a significant tidal range, strong tidal currents, high sediment transportation rates, and they are at the same time important shipping channels as well as designated NATURA 2000 sites protected by EU legislation. As estuaries are valuable natural ecosystems on the one hand as well as being intensively used by society, their management requires both the maintenance of natural structures and processes as well as the coexistence of various uses and sustainable economic development. A strategy to meet these demands is the application of integrated management, of which the Ecosystem Approach is regarded to be an essential element. 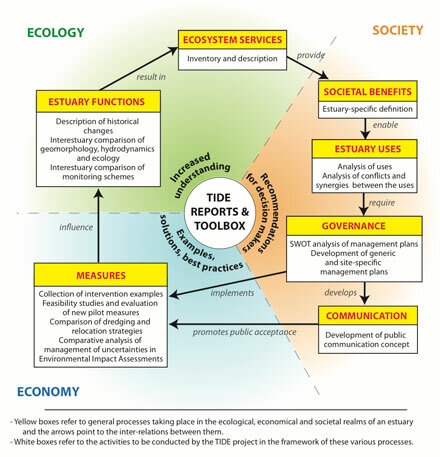 TIDE follows this approach and brings together relevant scientific disciplines and various institutions related to estuarine management for generating knowledge on estuarine functioning, analysing and evaluating governance structures as well as restoration and management measures. 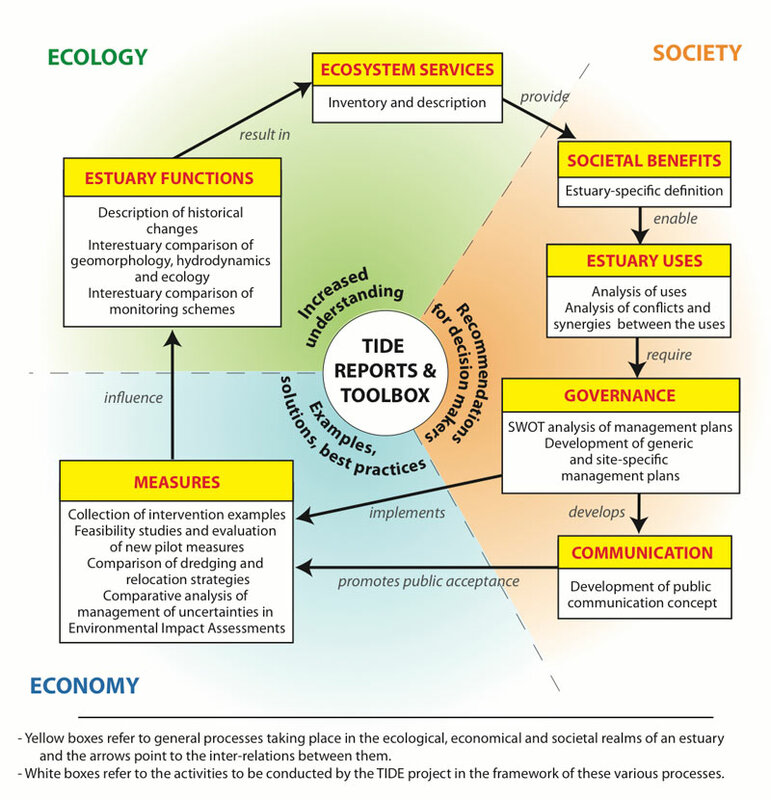 The understanding of the TIDE partners, how the different work activities within the project belonging to different categories of integrated management are linked to each other can be seen in the figure “ Understanding TIDE”. It is the aim of the TIDE partners to learn from each other in order to be able to develop instruments and identify state of-the-art and governance solutions for estuarine management. TIDE wants to share the knowledge and the experiences made with other interested or responsible people, institutions and stakeholders at a regional, national and international level. Therefore TIDE findings and a film produced on behalf of TIDE will not only be published on this website, but will be communicated and/or shown to the interested public at conferences, seminars, lectures, events, etc. The project´s budget of 3.7 million € is financed 50% by the INTERREG IVB North Sea Programme and 50% by the partners themselves.